Herman Leonard catalogued the development of one of America’s greatest art forms. All-Star Jazz: The Photographs of Herman Leonard, on view March 5 – July 10, 2011, in the Akron Art Museum’s Fred and Laura Ruth Bidwell Gallery, presents some of Leonard’s finest photographs and offers an intimate view of countless jazz legends and the nocturnal world in which they thrived. Leonard created a visual diary of post-war jazz by photographing his subjects during performances, rehearsals, recording sessions and backstage gatherings. Interested in photography since childhood, Leonard earned a BFA in the subject from Ohio University before opening a studio in New York City’s Greenwich Village. There he began to regularly photograph jazz musicians. He went on to photograph performers all over the United States, Europe and Asia. Leonard’s 1949 shot of Billie Holiday is a classic example of his style. He captures “Lady Day” with dramatic lighting: a dancing cloud of cigarette smoke offers a bright highlight amidst before dark shadows and suggests the hazy atmosphere of the night club. Other photographs in the exhibition that show performers relaxing and rehearsing reveal the amount of comfort and trust felt between Leonard and his subjects. All Star Jazz is drawn predominantly from the collection of the Akron Art Museum, which owns a cross-section of Leonard’s work thanks to generous gifts of photographs from Eric Alterman, Robin Krasny and George Stephanopoulos. The exhibition was organized by Curatorial Intern Kathryn Fodor. This exhibition is organized by the museum and sponsored by a generous gift from Fifth Third Bank. 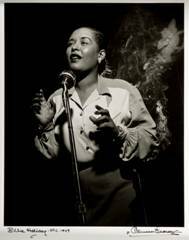 Herman Leonard, Billie Holiday, NYC, 1949 (printed later), Gelatin silver print, 14 x 11 in., Collection of the Akron Art Museum, Gift of George Stephanopoulos 2008.126. This entry was posted in akron, Art News, arts, canton, cleveland, history, jazz, museums, music, ohio, shows and tagged akron, arkon, art, art news, exhibit, exhibition, gallery, museum, ohio, show. Bookmark the permalink.